Firstly to be clear, Lotto Master Formula (also referred to as ‘Lottery Master Formula’) is a downloadable ebook. It’s nothing to do with the old LottoMaster software which is no longer available. There are quite a few big claims here, so lets take a look at those first. Apparently we have 131 people who have so far bought this system and proven it works. Or as Garry G puts it, have had ‘extraordinary success’. The apparent proof of this comes below the claim in the form of 10 screenprints of emails received. But curiously 9 of these don’t make any claims to having won anything at all. The 10th claims a decent win of $750,000+, but is anonymous so we have no way to verify this one. And things just seem to get more confusing from here. The headline on the site says we need $5 to play this system, but later on it says $10 or $20. 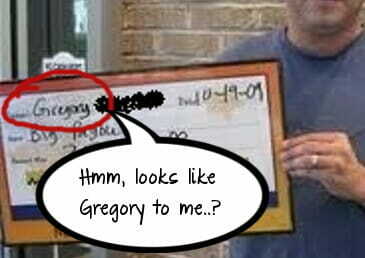 And we’re not sure if the system is supposed to have been developed by Garry G, Greg or Gregory – all are mentioned! The winners photos shown are supposed to all be Garry. But they are for various different States and countries, which does seem strange. Why play other countries games when you can simply win at home? Perhaps these were all simply nice holidays funded by previous lottery winnings. But the Gibraltar one which states it was a vacation throws up more confusion. That ‘Party Bingo Lottery’ winnings letter is unfortunately a known lottery scam..! Gibraltar does have a national lottery, but this is not it. So it’s not a real lottery game, and the winnings referred to are not real either. I’ve also been told that the picture used can actually be traced back to a website warning people about that particular scam letter. The Gibraltarian Government have also made a public statement about it too. Also, you remember those 131 people that have ‘proven’ the system? Well, the website has said both that, and that there are only 500 copies for sale since at least June 2011. So we have a lot of inconsistent claims here, which don’t provide much in the way of fuzzy reassurance. But what of the actual system itself. Well, it’s more disappointment I’m afraid. Because it’s not really a system. Certainly not in the way it’s described. This book is a general overview of lots of theoretical ways to analyse lottery games. Frequency analysis, positional analysis, repeat numbers, skip/hits, hold/cold, wheeling – it’s all here. But it’s a very short book and nothing is covered in any depth. I also say theoretical because despite this content originating (more on that in a moment) back in 1991, and the theories themselves being far older than that – there remains no evidence that this kind of analysis produces combinations that are any more likely to win than a quick pick! Yes, large numbers of people do avidly use these methods. And sometimes they win. But large numbers of people also play quick picks – and they win too. But the biggest problem of all, as I alluded to above, is that this book is not just repurposed from old material. This is actually a word-for-word identical copy of this book on Amazon. And I do mean identical – right down to the charts, diagrams and old fashioned drawings. 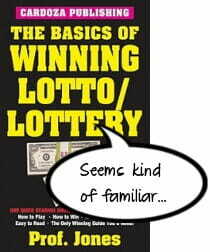 It’s also 5 times the price of ‘The Basics Of Winning Lotto/Lottery’ by ‘Prof. Jones’! If we also come back to the claims on the website however, things don’t seem to bear any real resemblance to what you actually get. I don’t see where the 66.2% jackpot accuracy makes any appearance in the book, or the 78.9% for smaller wins for example. There isn’t really a formula here, or even any kind of cohesive strategy. So is the Lotto Master Formula real? Well, I’ll leave that to your judgement. Clearly it isn’t worth paying $97 for a downloadable copy, when you can get a proper book version of exactly the same thing from Amazon for less than $20. Just under a different title. But frankly I struggled to find even $20 of value in it. Any business selling the “idea” of itself for say $100 is worth exactly $100. Why on earth would anyone sell a strategy with that great success rate for just $97? Isn’t it clear that… most people try the easiest way in order to get things that are usually achieved the hard way? However it doesn’t work like that. A man complains about his/her weight… I’ve tried everything but exercise and diet, but I cannot lose weight anyway! The final word is would such a thing keep lotteries in existence or would it make lotteries extinct? I am trying to contact you regarding a refund of this product, asap. I have not been able to locate a phone number for this website customer service. I bought this product on Oct 2, 2016 and its has NOT been successful for me. I am requesting a refund. Please email me contact information asap. Hope you managed to get that refund Cecilia. Very good analysis. I’m very happy people like you are moved to being a ‘protector’ from scam and bunko artists. Can’t thank you enough. Keep up the good work. Guys please I need help – I’ve been losing the games I play, so what must I do to get better on that? Please help. Unfortuantely there’s no short answer to that (and no push button magic formula). Take a step back, and re-evaluate your overall strategy.